Mason Buttle is the biggest, sweatiest kid in his grade and struggles to read and write. But those are the least of his troubles, compared to his struggle to overcome the death of his friend Benny in the Buttle family orchard. When his new friend Calvin disappears, Mason is under more suspicion. His struggle to find Calvin and heal the rifts in his heart and his community will capture readers' hearts. 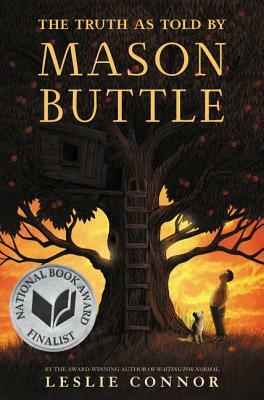 I love Mason Buttle - the voice Leslie Connor gave him, his dear sweet heart and his courage to revisit the loss of a friend. Like OUT OF MY MIND, Mason's story reminds us to see those who don't easily fit in; to love and support them whenever possible. A lovely novel for grades 4 and up.